Our 15 mile South Fork Lower Gorge rafting day trip is suitable for nearly everyone, from ages 6 to 106, including families with young children, big and small corporate groups, youth and church groups as well as Girl and Boy Scout groups. 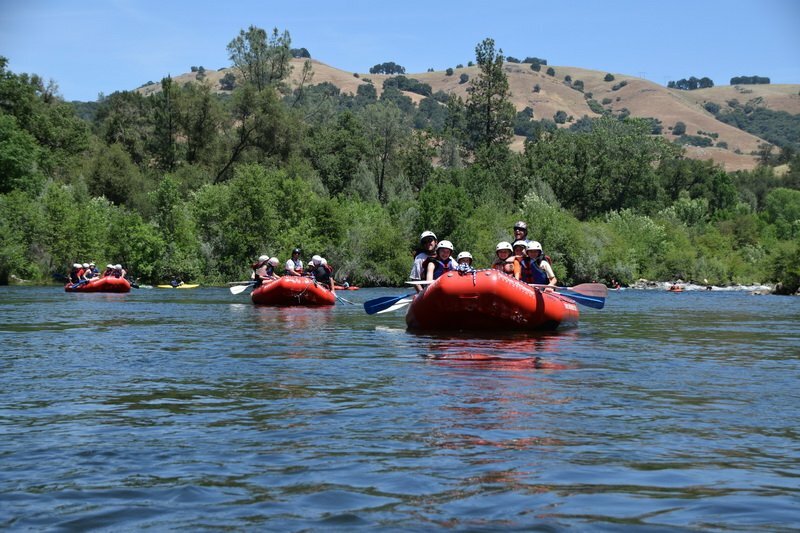 For the past 30+ years the South Fork American River has served as a perfect introduction to California rafting adventures for hundred of thousands of rafters. The main reason the South Fork of the American River is so popular is because it is a very safe river and has something to offer everyone. From thrilling rapids to beautiful scenery, historic spots and great camping – they can all be found when rafting the American River. 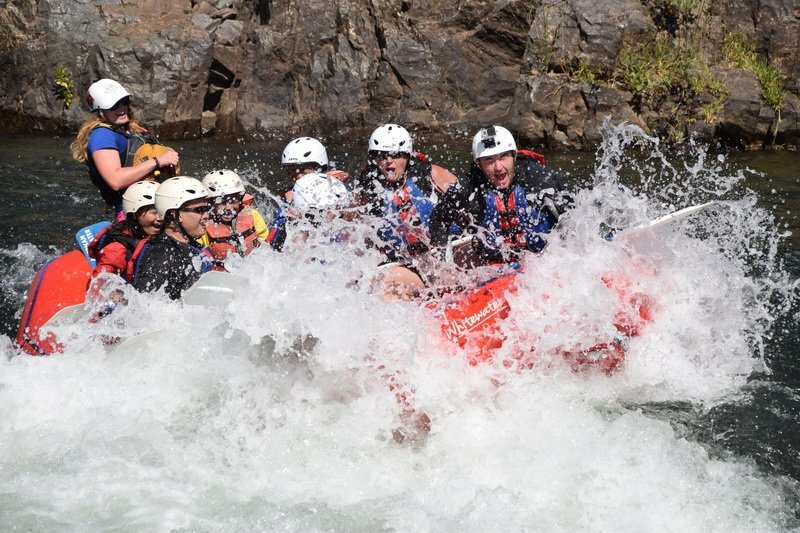 If you are a first time rafter looking to “test the water” or if you are simply looking for a great day out on the river, then rafting the American River’s Lower Gorge is the perfect trip for you. 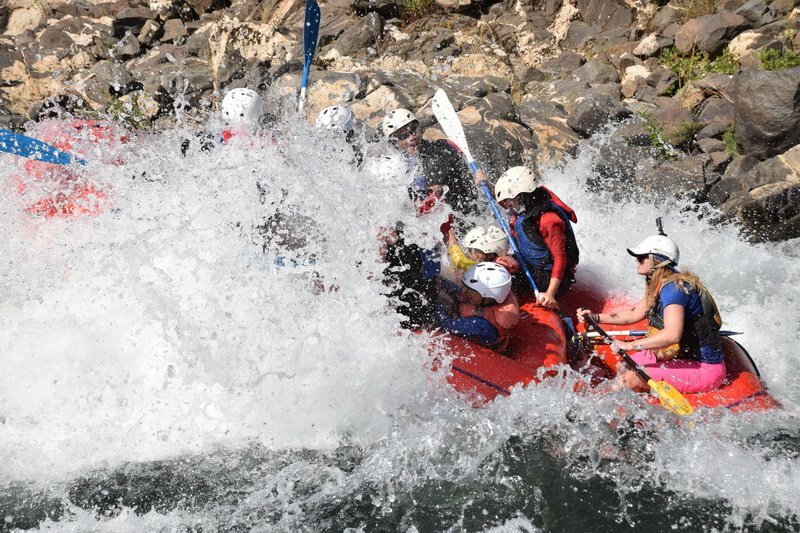 Our river camp and starting point of this trip is the highest on the river and therefor our Lower Gorge Day trip is the longest and best value of any white water rafting trip offered on the South Fork of the American River. 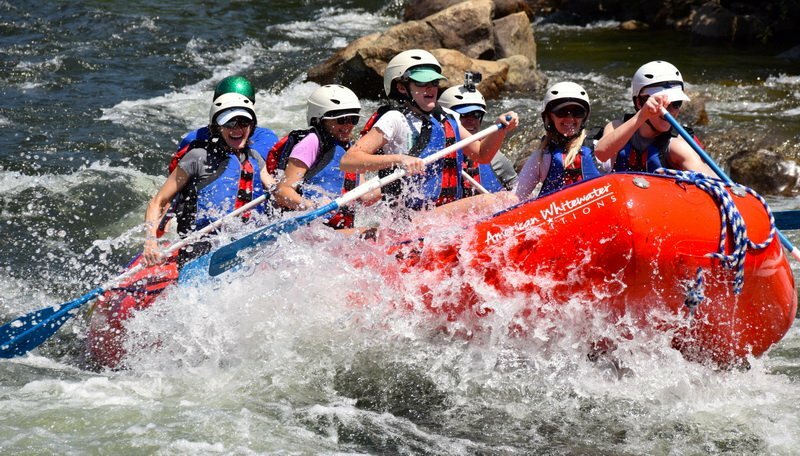 This approximately six hour whitewater rafting trip will give you plenty of time to relax, swim in the pools soaking up the sun, as well as enjoy fun Class 3 Rapids. Stop along the way for an hour to enjoy a hearty river lunch. Your trip starts at 10:00 AM when you meet for your guides at our campground and rafting base in Coloma. You can also take advantage of FREE camping the night before your trip. You will be given a short pre-trip briefing by your trip-leader, which will cover what to bring and what not to bring on the raft. You can ask lots of questions as well so you get a better understanding of what to expect on your rafting trip. Then you’ll walk through our gear cage where you will be given a lifejacket, helmet and paddle after which you will take a short walk down to the river. Once at the river your guides will make sure your life jacket and helmet are a proper fit. They will then give you a detailed safety talk and show you how to sit in the raft and how to paddle. 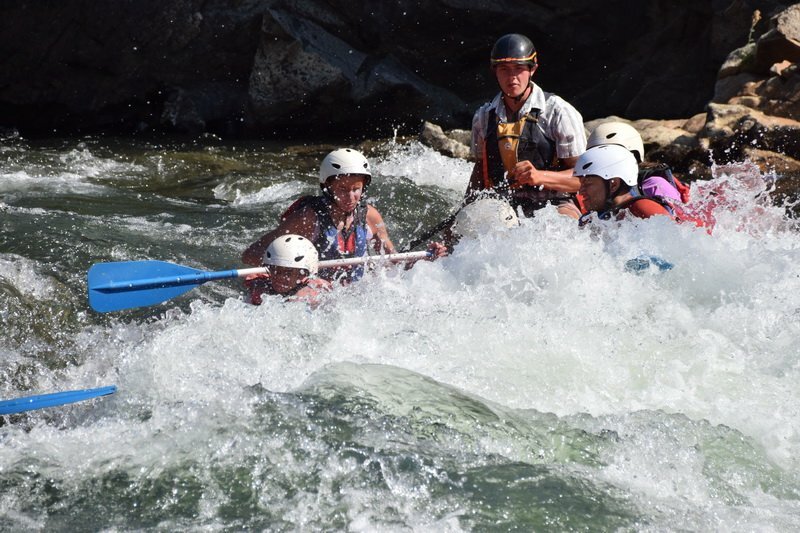 This South Fork rafting trip starts off with a slower pace consisting of mostly Class 1 and 2 rapids, great for warming up before getting into the bigger Class 3 whitewater. So sit back on the boat, enjoy and soak up the sun. After about an hour and half of mellow rafting and enjoying the scenery its time to get fueled up with a hearty lunch. We are well known for our yummy lunches and with several choices of meats, cheeses, vegetables, finger food, condiments and cookies, you will definitely not go hungry. We even have peanut butter and jelly for those wanting a taste of their younger days. After lunch its time to get back on the river and most certainly time to sit up and lock your feet in as you enter the Gorge Section on the South Fork with all the big rapids. Soon you will be getting very wet, screaming with excitement, paddling as well as laughing your way down rapids like Fowlers Rock, Triple Threat, Satan’s Cesspool, Hospital Bar. The few hours of rafting after lunch go by fast as you paddle from one rapid to another. After all the enjoyment of whitewater rafting your trip will culminate with your rafts entry onto Folsom Lake. The last few miles of flat water are made effortless as you will be towed out by our own Honda Jet Ski so you avoid a long paddle out on flat-water with a head wind. Once you are back on solid ground you will take a short walk up to our shuttle bus where there will be cold water and soft drinks for the 20 minute drive back to camp. Once back in camp you can take a hot showers and get freshened up for your trip back home. You will also get an opportunity to view photos of your rafting antics from the past few hours. By 5:30 PM you will be ready to head off to drive back home or continue onto your next adventure! 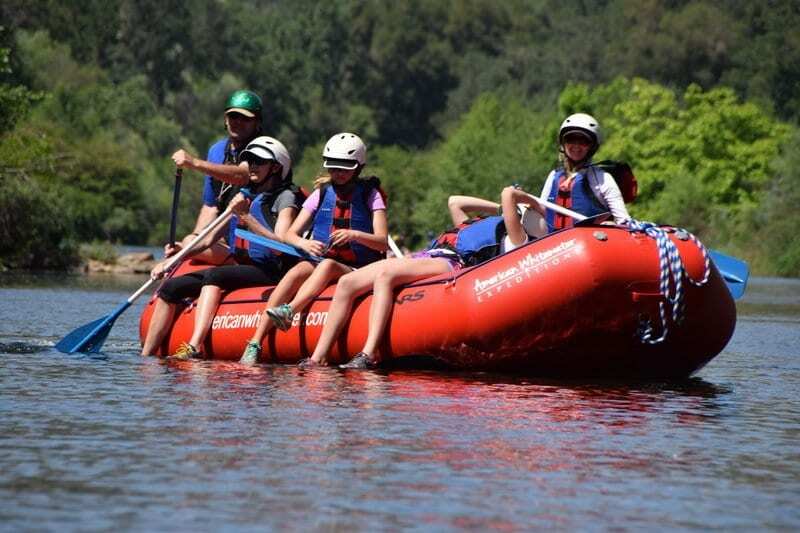 There are heaps of good reasons why American River rafting on the South Fork is one of the most popular river trips in California. 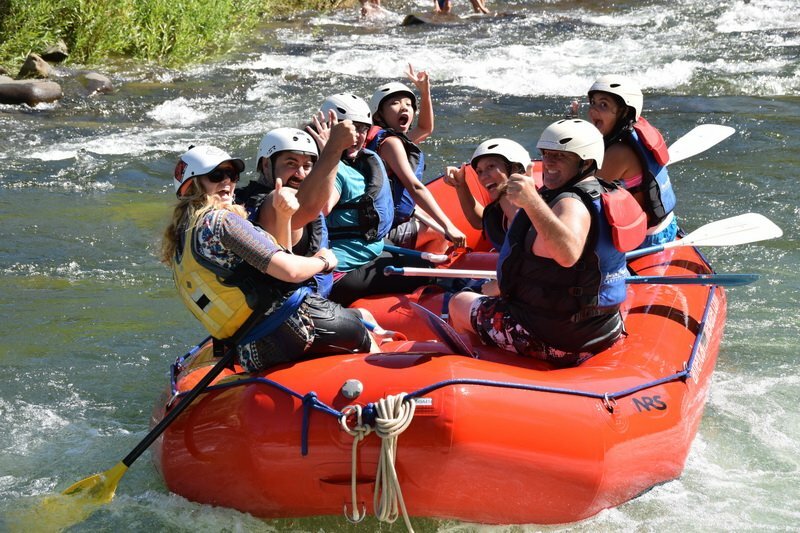 You will absolutely love the experience of rafting regardless of whether you decide to do a half-day rafting trip or a full day rafting trip on the American River. When other California rafting trips have dried up, the South Fork American River still have stable fun water flows from the Chili Bar Dam, always providing a exciting and fun time. 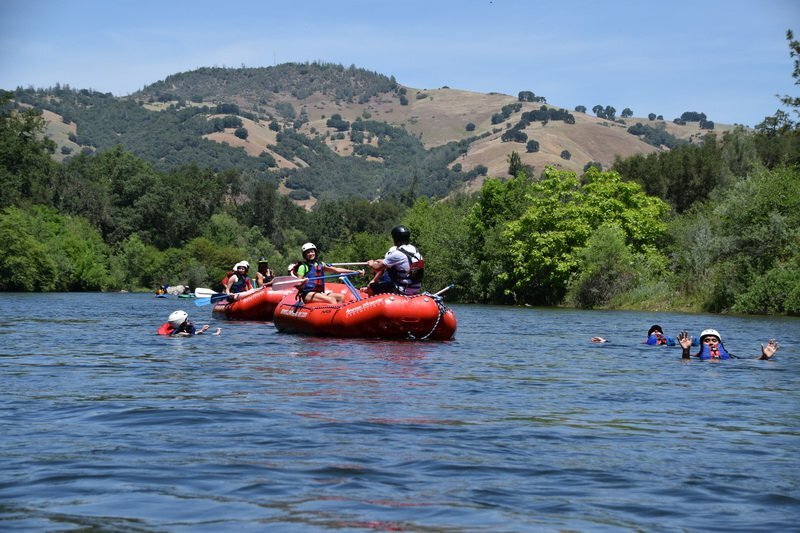 Even during drought years great recreational water releases are guaranteed and South Fork American River rafting trips are available from April through September and even on weekends in October. There are many memorable rapids as the river winds its way through the rolling foothills of California’s scenic Gold Country. Don’t wait any more – give us a call at 800-825-3205 and let us show you an absolutely fabulous time on the river. The South Fork Lower Gorge rafting trip is offered every day of the week. This trip departing from our River Camp in Coloma. Click for Directions. This trip leaves our River Camp at 10:30 AM so it’s imperative that you arrive by 10:00 AM at the latest. We also offer a Lower Gorge Express trip for those that can only start their raft trip in the afternoon. Get ready for your South Fork rafting adventure! Check out our Equipment List for items you will need for your trip as well as Maps and Directions to our River Camp. Group SpecialsFor every 5 paid rafter the 6th goes for 50%. For every 11 paid rafter the 12th goes for FREE. Large Groups of 12+ please call for Special Group Pricing. NOTE: Youth prices are ages 6 to 16. Prices are per person and there is an 8% Govt Land & River Use Fee added to all prices above.